What must be the heaviest piece of Maplewoodiana in existence is being exhibited at an area museum. Would you have any idea what that might be? 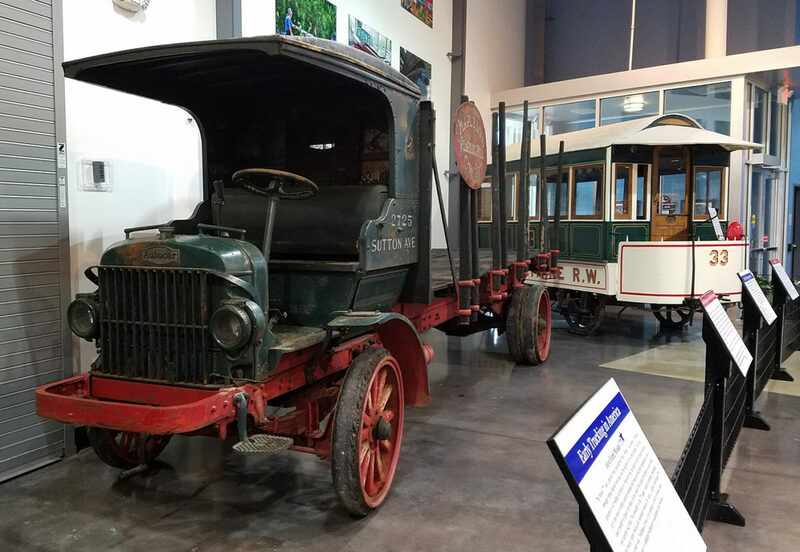 It might help if you knew that the museum is the very popular and fascinating National Museum of Transportation on Barrett Station Road. Recently I got an email from Mary Kennedy who works there asking me for permission to use some of our historic photos on their social media. They have had an item in their collection since 1961 that was probably seen by many people who were in Maplewood between 1925 and 1961. 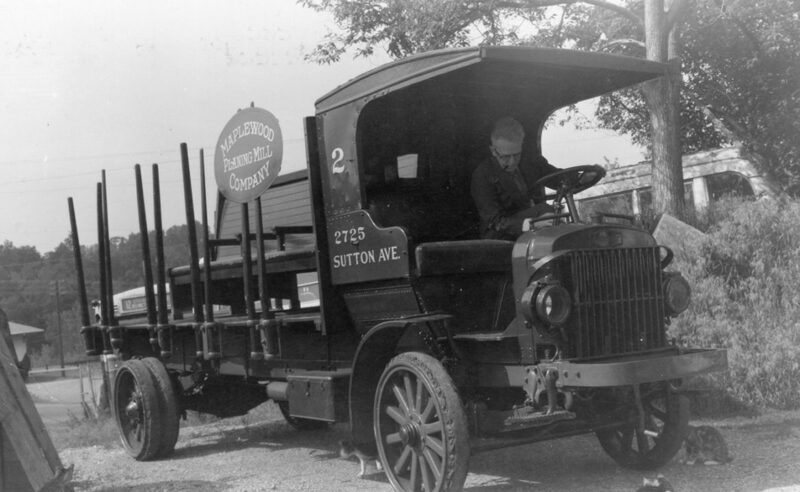 The item I’m talking about is the 1925 Autocar truck from the Maplewood Mill. The truck replaced the mule team that had been used to haul lumber from the railroad up to the mill. 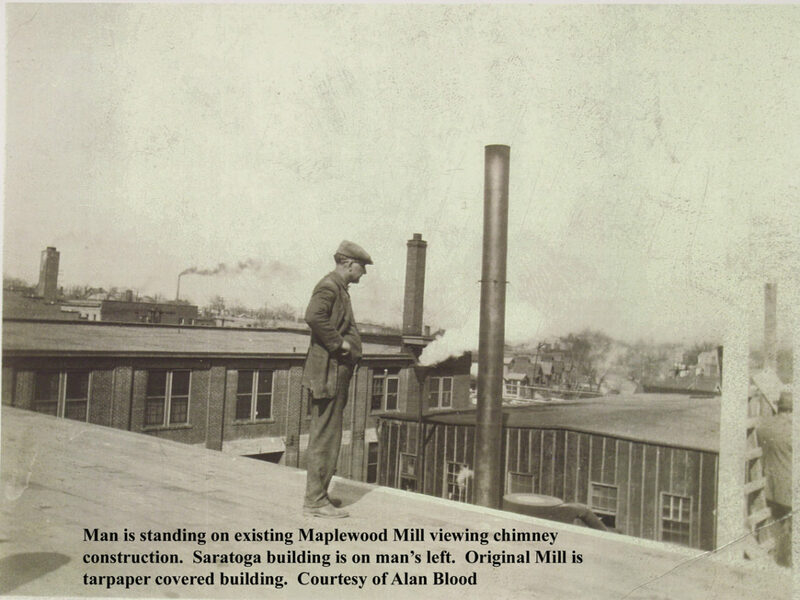 Alan Blood, grandson of Albert Carl Blood (the founder of the mill) generously allowed us to copy his historic photographs for an early historical society display. 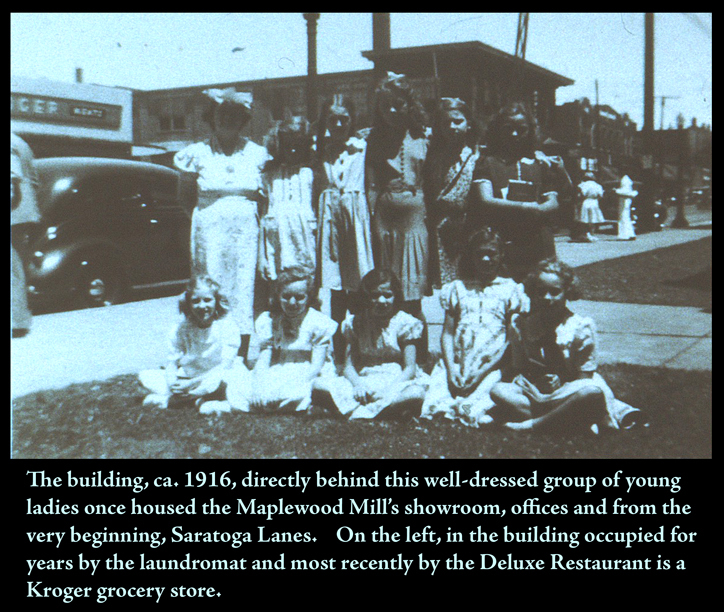 Outside of the library, his were some of the first historic photographs of Maplewood that I remember finding. There were many interesting photos in his collection but one in particular stood out to me. It was of the Autocar truck. Alan told me how it had been donated to the National Museum of Transportation. He said that they used to drive the truck down Manchester to Elmer Wind’s EJ Tire business on the Wedge to fill the gas tank. The truck was in use for 33 years according to information at the museum. They also record that a team of horses, a wagon and half a cartload of hay were traded for the truck. Alan wanted me to know how well that truck was made. Once when the head of the four cylinder engine had been removed for some repair, he said that the crankshaft (on ball bearings) could easily be turned by hand. I have always liked this sort of thing. I tried to get the truck brought back for our community block party, a precursor to Let Them Eat Art. It didn’t happen. No one wanted to leave the truck outside all night. When it was on a trailer, it was too tall to fit in the city garage. To my great delight I finally got to meet this Maplewood old timer in person, so to speak, this past week. 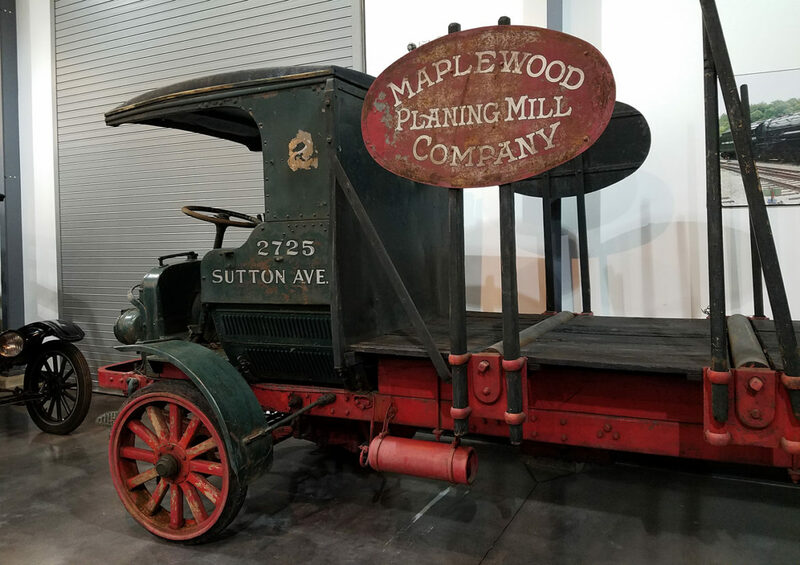 The Maplewood Mill Autocar truck is a prominent part of the new exhibit ” Early Trucking in America” currently on display at the Orthwein Center at the National Museum of Transportation. Don’t miss it! Wheels with wooden spokes and hard rubber tires. 58 years in storage have taken a toll but at least she’s still here. According to Alan Blood, one of the companies that the mill did business with paid to have her repainted right before she went to the museum. This is a fine looking machine. Fenders you could stand on. See the starter hanging down in front. All that’s needed is your arm. A little TLC and she’d be ready to go again. 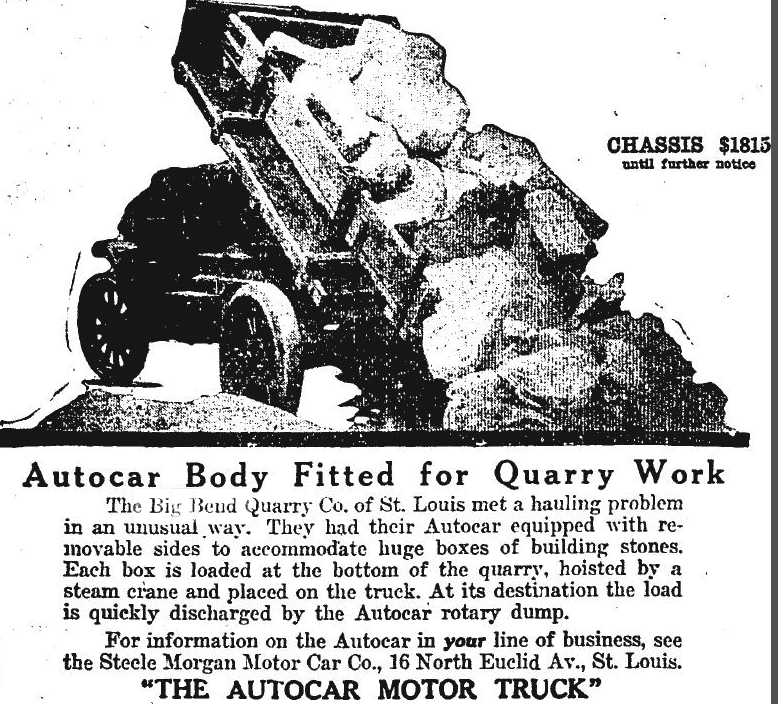 I know of two other Autocar trucks that were once in Maplewood. This one belonged to Floyd Fennell who was killed in a motorcycle accident in 1923. I wondered if this is the same truck? I still do. This is the other one. The Big Bend Quarry was once located beneath what is now the Sunnen business park. This is the image where I first learned of the existence of the truck. This must have been taken at the museum. You can see the paint job is new. It is #2. I wonder what #1 was? 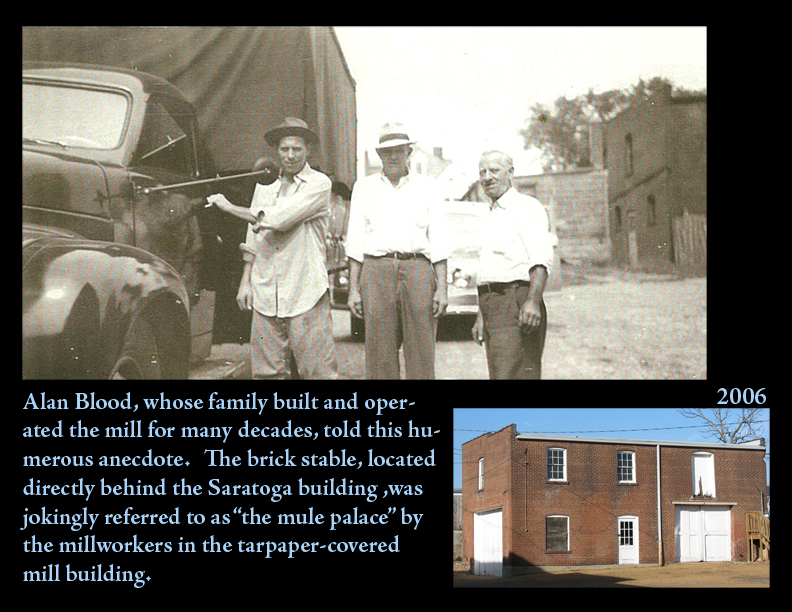 You may be familiar with these photos of the mill. I’ve run them before. The tarpaper covered building is the original mill. It was located where the parking lot for Saratoga Lanes is today. 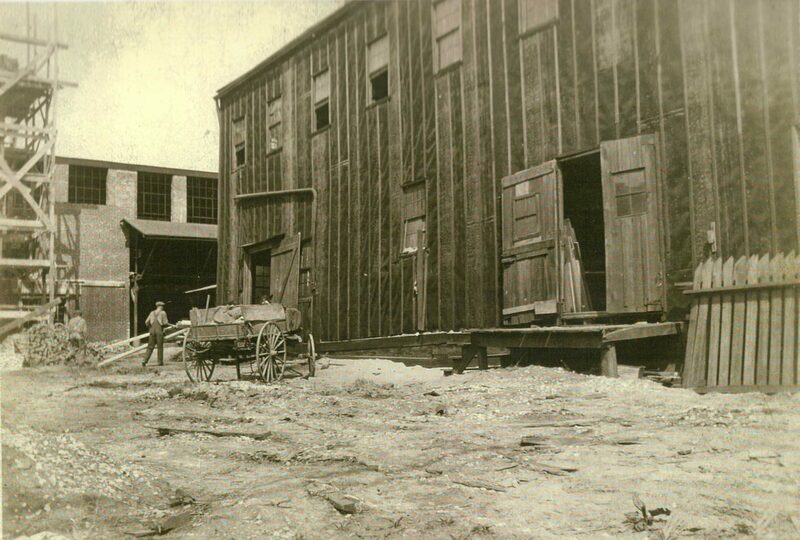 The newer, 1928, mill building is under construction in the background. This image I made for an earlier presentation. 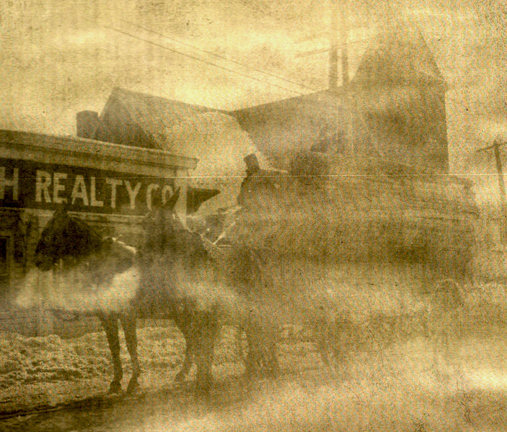 The “mule palace” still exists. It is directly behind (west) of the building that houses Saratoga Lanes. This was also done for an earlier presentation. 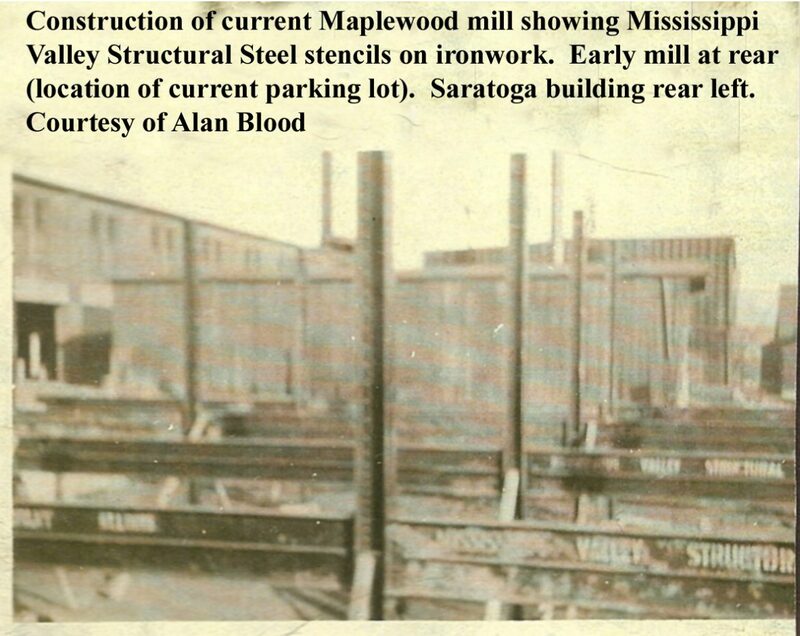 Mississippi Valley Structural Steel was also located in Maplewood. It too was once located where the Sunnen business park is today. I think this was made for the very first display done by our fledgling historical society. We set up in a couple of vacant store fronts. They were just a door or two down from where the Maya Cafe is today. If I remember right, Mary O’Neal cut out those decorative papers for the captions. That truck is from the Curtiss Wright company known for their aircraft. Again…done for an earlier display. The restaurant occupying that spot today is the Dubliner. The mules that the truck replaced. The church is at Hazel and Sutton and still exists. I hope you have enjoyed this post. Just one more thing…Your shoe is untied. I love the old truck and the condition that they have it in. Not everything is all shiny and bright. I noticed the wood wheels and the solid rubber tires and have to wonder what that thing was to ride in. Driving over old gravel roads, maybe cobblestones even if the top speed was not very fast makes me wonder how you were not bounced right out of the seat. Did Maplewood ever have cobblestone streets? Then there is no windshield, no doors no heat in the winter. This is one ride that does not make me long for the old days. Hi Mark, In answer to your question, did Maplewood ever have cobblestone streets? I don’t think so. Perhaps there were some cobblestones along the streetcar lines. See this past post of Miner’s. http://40southnews.com/street-car-tracks-and-cobble-stones-exposed-on-big-bend/ I can’t tell if those are cobblestones or bricks from the photo. They look a little large for bricks but bricks would be much more likely. The Maplewood Subdivision (bounded by Manchester and Elm on the north and south and Marshall and Big Bend on the east and west) advertised that it had Telford streets and Granitoid sidewalks. I assumed the Telford streets referred to the older brown concrete streets of which we still have a few. I’ve always thought these streets with their brown Meramec gravel are more attractive than the modern ones of gray concrete. That Meramec gravel wears like iron. The streets have lasted over 100 years for some of them. The specifications for our new concrete streets also call for Meramec gravel. There are some pretty hip folks at city hall. As for riding in that truck, I don’t know how you could do it without a seat belt. That is a real truck in every sense of the word. It is the polar opposite of the luxury freeway flyers that we call trucks nowadays. I’d bet the top speed was about 20 mph with 15 being more reasonable. I just read some old truck advertisements. One stated that you could get the hard rubber tires that lasted longer but they recommended pneumatic tires for increased comfort. Imagine trying to start that thing when the temperature is in the teens and the oil is as thick as mud. I bet the biggest fellow got that job. The truck has a small tank mounted to the frame on the left side. They didn’t know what it was for at the museum. I don’t either but I read that some very old cars had small tanks for acetylene. Nope it wasn’t for a cutting torch. It was for the headlights before the advent of the modern electrical system. Thanks for your comment. Doug, I wish my dad was alive still because I would ask him about the small tank on the truck. I seem to remember that he showed us an old John Deere tractor with a similar tank. 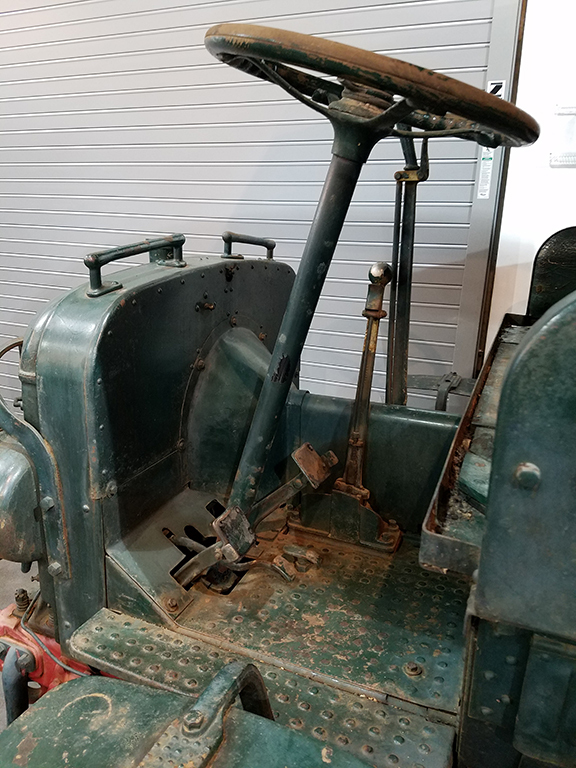 I think it held another type of fuel that was used to start the tractor, maybe gasoline and once started you switched the fuel over to Kerosene which was cheaper to buy. Not sure I have that right but something like that. My other thought was did this truck have a dump bed on it. It might have been a hydraulic oil for the dump bed. I agree with you on getting bounced out of the seat on that thing. Somedays on some of our local streets I feel I could be bounced out of my seat with all the pot holes in them. Of course I am driving much faster than 15 or 20 but still I cannot imagine no shocks, hard tires and a hard seat that would do nothing but jar you with every bump in the road. Doug, contact the people at museum about those tanks, they may know or could find out what those tanks are for. If you look at the early photo of it at the museum, the one below the advertisement, you can see a tank on the passenger side of the truck too. Mike, The woman from the museum who I had arranged to meet asked my friend and I if we knew what the tank was for. My friend wondered if it might be for an air assist on the brakes or possibly a vacuum for something. I took your advice and emailed the company. I’ll let you know if I hear back from them. Thanks for sharing your ideas. I saw the truck displayed at the museum back in the early 80’s and noticed that it was gone the last time I was there several years ago. I remember when I saw it in the 80’s I was so excited because of the connection to Maplewood and then disappointed when it was gone. I am glad that they have placed it back on display. Hey Mike, When I first tried to bring the truck back for our block party in probably 2003 or 2004, the museum had her stored at an off site location. She was inside a building. I got a photograph of her from them at that location. They offered to take me to wherever she was stored and I intended to go. I never got around to it. I really was thrilled to finally get to see her. 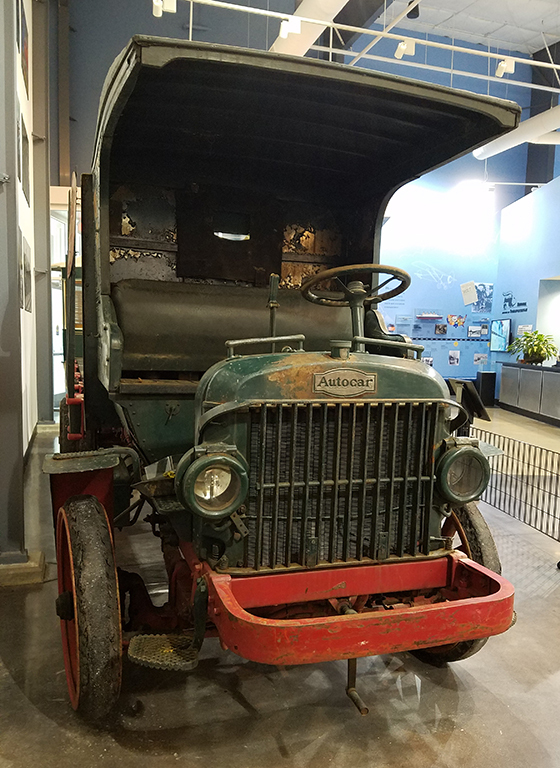 I remember from visits to the museum when I was very young that they had a truck similar to the one from the Maplewood Mill that they were still using! I think it had a small boom and winch on the back like an old tow truck. Those hard rubber tires stuck in my mind. Maybe 20 years ago I went to a farm show in St. Peters that featured a lot of antique farm equipment. I recall they had a similar truck, a Buick no less, that had been used on a local farm for 60 years. I probably have a photograph of that one somewhere. I almost certainly will never see it again. It is lost in an avalanche of slides somewhere in the closet. I’m glad they have “our truck” on display too. Thanks for your comment. Doug – thanks! Funny thing is my dad always thought the museum might have “cannabalized” the truck. I am happy to see he was mistaken. He would be so proud to see the truck on display. I will be heading to Barrett Station very soon. You’re welcome, Scott. 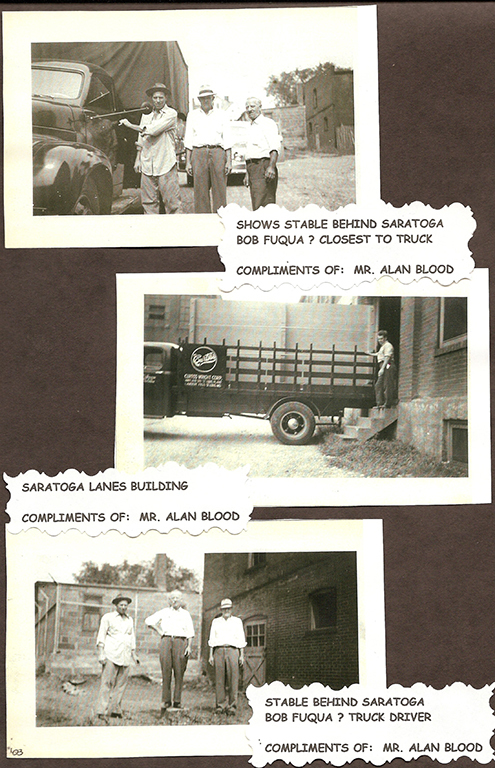 Thanks to you and your Dad for sharing these (and others) historic images with us and the truck for posterity. I’m glad they didn’t cannabalize it too. The paint job has faded since it was gifted to the museum but it is intact as far as I can tell. When I put this post together I noticed for the first time the #2 painted on the side. Do you remember there being a #1? If so what was it? It is good to hear from you, Scott. Be sure and tell them who you are at the museum. I appreciate your compliments, Joe. You’re welcome.